When my dad died we did the thing that everyone does, which is to say we spent a lot of time looking through old photos. Through albums and shoe boxes, on old phones and computers we pieced together a visual representation of my dad’s life from black and white pictures of a toddler to the 66 year old bespectacled man he became when he left us. In all those pictures the ones I most enjoyed seeing were the ones of my dad when I was a kid, they way I remembered him most clearly. He was a little chubbier then, with more hair that bore a more vivid shade of orange. Mostly though, he looked the same. One of my favorites was one of him and my mom with three other couples on what looked to be New Year’s Eve in the very early nineties. They’d clearly used a self timer on their cameras, the eight couples sitting on the couch or floor in front of the couch. These couples were my parents’ closest friends during the years of school age children. Some of them were still their closest friends. In this picture from New Year’s Eve they all wear party hats and have silly blowers, festive props to ring in another year. They’ve clearly been imbibing that evening and each of the 8 adults look so carefree and happy. They’re laughing hysterically at something and are the poster children of what it looks like to have fun with your friends. I treasured that picture when I came across it, but having only a toddler and one year old at the time, didn’t quite connect it with my own circumstances. It was just fun to see a picture of my parents so clearly having fun. Now, though, two kids later and in exactly the same life stage as my parents were when that photo was taken, I know the deeper story that picture tells. I know how hard it is for eight thirty something adults to coordinate schedules and baby-sitters (on NYE at that!) so that you can all be together for an evening. That type of planning can take months. On the Saturday after Christmas one of my friends from college invited us all to a “No Stress Saturday” party. After weeks of non-stop fancy holiday parties we put away our heels and dress clothes and wore sweatpants instead. She catered Chipotle and put out a few easy hors d’oeuvres. The hosts sent their kids to stay at Grandma’s house for the night and the rest of us left ours at home. We showed up with wine and beer and gin and we showed up ready to play. These friends of mine, we’ve known each other almost 18 years. We knew each other when were actually nineteen, not 30-somethings trying desperately to catch the feeling of being 19 again. Now, though, we have real jobs and responsibilities among us. We are doctors and lawyers, engineers, marketing execs and teachers. Many of us have kids (about 14 and a half between us) and we are all juggling a lot of spinning plates that make nights like this, with all of us in attendance hard to come by. We caught up, swapped Christmas with the family tales, drank wine and beer and played drinking games our children will one day be shocked and scandalized to know their parents knew how to play long before they did. And for a night it really was a no stress Saturday. No one needed to be at work the next day, no one’s baby was crying or eight year old was mouthing off (because they’d watched Home Alone and picked up a little too much Kevin Malone attitude). We played and drank and laughed like we did when we were in college, with zero regard for our responsibilities and next day agendas. I have memories of my parents and their friends laughing uproariously at Friday night pizza nights. The kids were punted to the basement where we played and acted out our own versions of Lord of the Flies and upstairs we could hear our parents cackling with laughter. Now, in the thick of that same season of life I know how important it is to have friends you can laugh with. Friends who arrange their schedules to be together, with or without the kids and chase that feeling of being carefree and light. 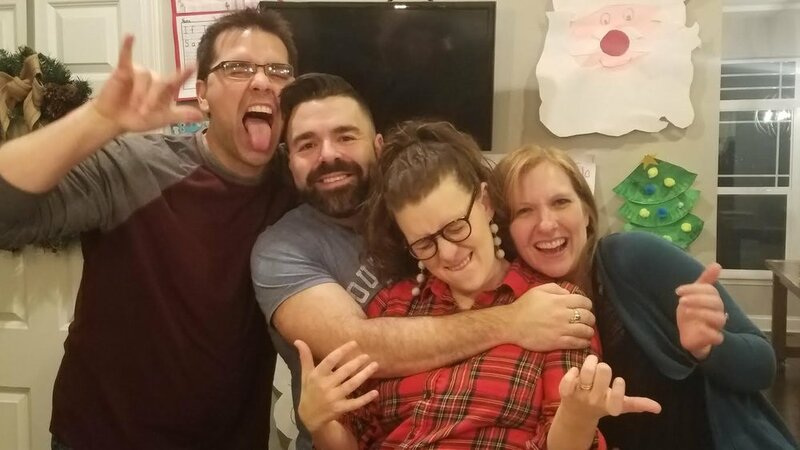 Friends who still play a drinking game or two even though they’re 35. Before the end of the evening we set up the self timer on the camera and all got in for one group shot. We’re smiling and happy and there are incriminating red solo cups scattered across the counter. I hope someday my kids come across this picture and smile at the sight of their parents clearly having too much fun. I hope they’ll know just how hard and just how worth it it is to chase after a few hours of carefree fun with your friends. And I hope they’ll have their own thirty-something friends to be carefree with, if only for a few hours.